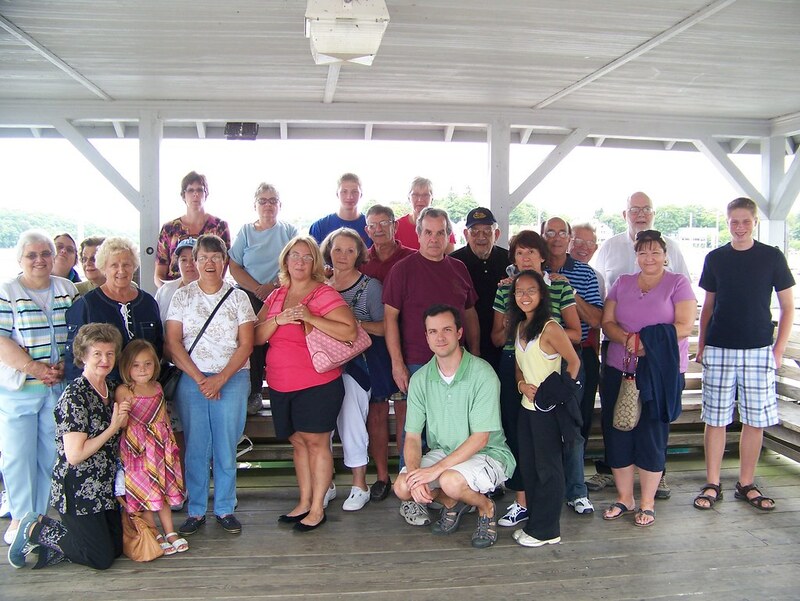 On Sunday August 15, 2010, a group of thirty parishioners and friends set off on the Sea Mist for a tour of the Thimble Islands. The Thimble Islands, named after the thimbleberry, is a collection of small islands in the Long Island Sound located off the coast of Branford, CT. The islands are made up of Stony Creek pink granite bedrock which were once the tops of hills prior to the last ice age. Discovered in 1614 by Adrian Block, the Thimble islands consist of 21 Islands with a total of 81 houses: 14 islands have only one, one (Governor) has 14, one (Money) has 32, and the rest have between two and six. The houses are built in a variety of styles, ranging from a 27-room Tudor mansion, with tennis and basketball courts and a caretaker's residence on 7.75 acres on Rogers Island, to small summer cottages built on stilts or small clusters of buildings connected by wooden footbridges. Some of the houses cover a small island completely, while Money Island, 12 acres in size, bears an entire village of 32 houses, a church and post office buildings, concealed among tall trees. Some of the houses were once occupied year-long, but now are only used in the summer. The exposed nature of the houses makes them dangerous during storms The exclusivity of the houses has made them quite expensive, therefore residents are divided between local families who have owned their homes for generations, and more recent residents who tend to be wealthy. The rich history and interesting landforms and homes of the Thimble Islands made for an interesting afternoon for those in attendance. The posted photos show scenes from the cruise.